Located in the desirable lower Deer Valley area, this property offers the best of everything. Enjoy easy access to Historic Main Street District, the free shuttle system main station, as well as only moments away from Deer Valley and Park City Mountain Ski Resorts. 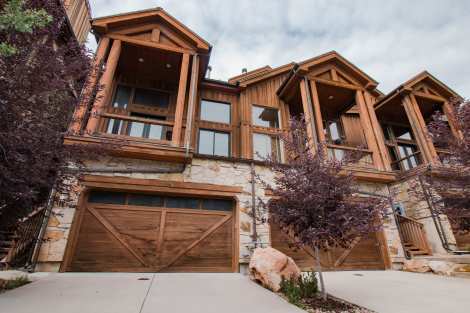 Boasting room to sleep up to 12 guests, and located adjacent to our Deer Valley Drive 5-bedroom A property, this is the perfect spot for large groups looking for a luxurious Park City getaway. Newly constructed, no detail has been left to chance. Guests will relish the attention to the finishes including hardwood floors, granite countertops, gourmet kitchen and custom furnishings throughout. The master includes an en suite bathroom with jetted tub and a private deck with hot tub. The in-property theater room is perfect for cozy nights as is the gas fireplace located in the main living area. Room for your car in the 2-car garage with heated driveway, or enjoy easy access to the free transit system and walkability of lower Deer Valley where everything is just out your front door.